Who could have anticipated something like this? For an unknown rookie to go against Snowpiercer, the USD 39.6 million dollar global project from Korea’s leading director BONG Joon-ho, with the public release of his first commercial film The Terror, LIVE (a CINE2000 production) on the same day! Summer theaters in 2013 all seem to be enraptured by the dominant force of Snowpiercer as nationwide ticket sales have pushed forward with a whopping four million in a single week for the blockbuster. Nevertheless, if it’s just a matter of practicality, The Terror, LIVE seems to have the upper hand. Spending only KRW 3.5 billion (approx. USD 3.1 million) on production costs, the film has already broken even with two million admissions in just six days while Snowpiercer still has a long way to go. 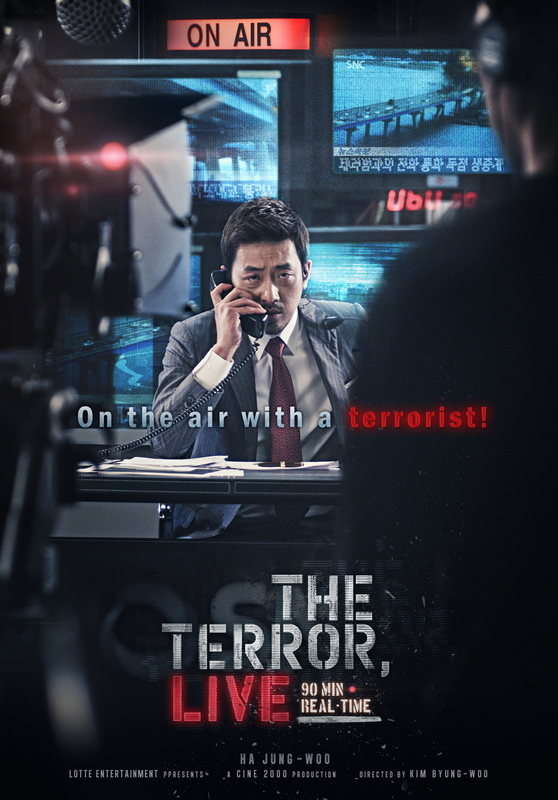 The lucky ‘rookie’ who directed The Terror, LIVE is KIM Byung-woo. With three films including The Terror, LIVE filling out his filmography, his talent has looked promising since the start. His feature debut film Anamorphic, which he directed while still a film student at Hanyang University, received rave reviews from the Puchon International Fantastic Film Festival (PiFan), RestFest and the Seoul Independent Film Festival, while his graduation film and second feature Written (2008) received the NETPAC award at the Karlovy Vary International Film Festival. It was around this time that the mainstream Korean film industry started approaching him for work. He wanted to begin his commercial film career with a well-made thriller that could keep the audience on their toes until the end credits were done. By chance, he was gazing out his office window looking out towards the Han River and came up with an idea for a film. It dealt with a live broadcast of a tension-packed terrorist situation which also invoked the horror he felt while witnessing the shocking images from the 9/11 terrorist attacks on TV. And Voila! Out came the premise for The Terror, LIVE, which tells the story of an anchorman’s ambitious grab for fame when his shot at monopolizing an exclusive live broadcast of a terrorist’s attack following the explosion of Mapo Bridge on the Han River goes haywire. - Was The Terror, LIVE always destined for a summer release? - The subject matter of The Terror, LIVE is typical of large-scale blockbuster films. But instead of indulging on scenes of terrorism, you chose the closed space of a newsroom to push forward with the story. Was this in consideration of the relatively tight budget you had to work with? I actually think I’ve spent too much. (laughs) When I first started to write the script, I thought it would be fun to work with this kind of concept. It was the investors who decided to set the budget at KRW 3.5 million after reviewing the script. There is nothing really unique about the storyline itself. If I chose to spread the story out and wrap it up into a blockbuster disaster film, I believe the results would have become something you’ve already seen somewhere else in other films. It seemed to make more sense for me to hang on to that one crucial element while getting rid of everything else. I wanted to bring the audience right next to the protagonist and make them experience the tension and urgency as if they were there in person. The most important focus in this scheme was the newsroom to which the terrorist makes the phone call and the anchorman. Those were the two things I wanted to expand from to create a well-orchestrated situation. - This film automatically recalls Phone Booth (2002) starring Colin Farrell and the TV drama series 24 as well as Tony Scott’s adrenaline-pumping Enemy of the State (1998). A filmmaker should see and absorb as many films as possible, but I’m really not that diligent. Rather than Phone Booth or 24, I went to films like Cloverfield (2008) and United 93 (2006) to reference the documentary feel that these films gave off. Classic films include titles like Hitchcock’s Rear Window (1954) and Sidney Lumet’s 12 Angry Men (1957). The protagonist YOON Young-hwa in my film, played by HA Jung-woo, moves in a similar manner as James Stewart in Rear Window while I was able to get a few tips on keeping the tension fully-charged until the end from Steven Spielberg’s Duel (1971). - How was it working with HA Jung-woo who is known for his instinctive work style? On the set, he rarely seems to follow his instincts when playing a role. He already comes to the set with his own character breakdown which he unfolds as he performs. He knows what he is doing which makes it unnecessary for me to look for other options. But to get to this point we spent considerable time during pre-production breaking down the script together. And during the process of reviewing the script, striking out and adding things, the protagonist slowly changes into a somewhat different character: Of course in a more positive direction. The idle remarks and witty dialogue YOON Young-hwa presents at the beginning of the film were all things we came up with during the discussions we had prior to production. Such a light start seemed to work well as an effective contrast to the high-strained tension which was to follow. - I heard the manner in which you shot the film was quite unique. Three Red cameras and two cameras used for TV broadcasting were set up to capture every angle of the newsroom. Unlike most films that are divided by scene and sequence, The Terror, LIVE was structured into 21 chapters whereby one chapter was done in a single take. Slight glitches in dialogue delivery or movement were bypassed to keep with the flow of the chapter, and independent scenes were shot additionally from different angles. We chose to shoot in chronological order to maintain the protagonist’s emotional flow as the actor’s performance was the most crucial aspect of the film. - Some have criticized the terrorist’s underdeveloped character due to an excessive focus on the main character. You don’t seem to be paying that much attention on building a human connection between YOON Young-hwa and the terrorist. That is something I do regret. Actually, there used to be more dialogue explaining the terrorist, as well as more plausible details on the terrorist’s attacks that had to be cut out during the final editing stage. I guess you might say it was a matter of losing one to gain another. As speed was a significant factor, I believed any slight jumps in emotion could be overlooked. - What are you working on for your next project? Nothing at the moment. I would like to come up with something that is the result of intense exploration - both creative and uniquely ‘me’. I’m not fixed on making thriller films, but considering my personality, I don’t think I’ll be working on romantic comedies or melodramas.